Boyds, MD (September 1, 2017) – The Washington Spirit will visit Portland Thorns FC on Saturday for the NWSL on Lifetime Game of the Week. Kickoff from Providence Park is set for 3:32 p.m. ET. Washington and Portland have split the season series so far, each earning one-goal victories on their home fields. The Spirit earned a 1-0 clean sheet win over Thorns FC to open the series on June 24 at the Maryland SoccerPlex, and Portland countered with a 2-1 comeback win in the Pacific Northwest on July 22. The Spirit is coming off a narrow 3-2 loss against the North Carolina Courage in a midweek match-up at the Maryland SoccerPlex on Wednesday night. Spirit midfielder Estefanía Banini netted her first goal of the season in the game, and second-year forward Cheyna Williams finished off a brilliant month of August with her fourth goal in a six-game stretch. Williams enters the final month of the regular season tied with Havana Solaun for the team lead in goals with five, and could push her scoring streak to three games if she finds the net in Portland. Also leading the Spirit attack is U.S. international Mallory Pugh, who has three goals in her first 12 NWSL games and is just one week removed from recording her first pro assist. Last Saturday against Chicago, the 19-year-old sent a perfectly-placed pass on a free kick into Williams, who headed home an 81st minute equalizer, prior to Christen Press’ 87th minute game winner for the visiting Red Stars. In the midfield, Tori Huster leads Washington with 701 total passes this season, playing a key role in the possession battle while also racking up 31 clearances on the defensive side. Rookie Meggie Dougherty Howard is second on the team with 683 total passes, and is third on the team behind Shelina Zadorsky and Banini with a 76.1 percent passing accuracy rating. Defensively, Alyssa Kleiner is coming off one her most active games of the season, as she tied for the team lead with five tackles and three interceptions, while recording two clearances on Wednesday against North Carolina. On the other side, Portland is vying to clinch a spot in the playoffs this weekend. Like the Spirit, Thorns FC also a pair of leading scorers with five tallies each this season, in Hayley Raso and Canadian international Christine Sinclair. Close behind are Denmark international Nadia Nadim and U.S. international Lindsey Horan with four goals apiece. Defensively, Thorns FC has allowed the second-fewest goals in the league with just 19 conceded over the course of 20 games. 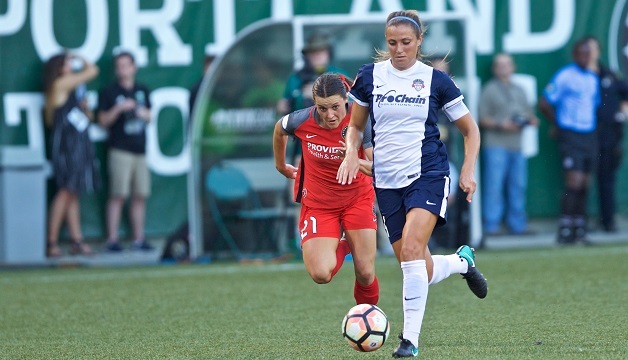 Following Saturday’s game in Portland, the Spirit will travel to New Jersey next weekend for a match-up with Sky Blue FC, before returning home to face the Boston Breakers (Sept. 23) and Seattle Reign FC (Sept. 30) to finish off the season. Tickets for all Washington Spirit home games are available at Tickets.WashingtonSpirit.com.